Tattoo skin care products are intended to help your tattoo heal cleanly, and then to protect your ink and help it last a lifetime. There are brand-name products available, but many tattoo artists will recommend simple solutions on the shelves at any drugstore. One problem with antibacterial ointments is that they can delay healing, leaving your tattooed skin raw and weepy for an extra few days. In addition, people with normal immune systems don't usually need antibacterial treatments. Tattoos can get infected, but it's not common. Most people can fight off any bacteria on their own. One antibacterial ointment that some tattoo artists recommend is Bacitracin, a mild antibiotic ointment, but it is not recommended that it be applied each time you wash your tattoo. If your tattoo artist recommends it, you may be advised to use it once a day or less. Always follow your artist's recommendations carefully. Lotions and moisturizing ointments are meant to keep the tattoo from scabbing, which can damage the tattoo and lead to scars. Most tattoo artists will recommend a favorite product and tell you to use a small amount and rub it in gently. Avoid using large gobs, because ointments can be a breeding ground for bacteria. Bag Balm: This old fashioned ointment is used to heal cracked and dry skin. It can help keep a tat from drying while healing. Aquaphor: Aquaphor is used to seal the skin, holding vital moisture inside. It can also help to keep your tat from drying. A+D Ointment: A+D delivers vitamins A and D inside a creamy paste. Typically used for diaper rash, this option can promote healing. If you spend some time reading different artists' recommendations for aftercare, you'll find that different experts have different methods. Recommendations for over-the-counter products are common, but you'll also find artists who recommend specific brands of tattoo skin care products. Most of these products were developed by tattoo artists or others affiliated with tattoo culture, and they all claim to help tattoos heal better than anything else available. Some are "all-natural," combining natural moisturizers and herbal extracts. Others have artificial ingredients but claim to be extra-gentle. Most of them appear to have been tested on actual tattoos, but not pitted against each other or against ordinary drugstore products. Tattoo Goo: Tattoo Goo makes a salve for new tattoos, as well as a lotion for healed tats, and a color care stick for use in the sun. H2Ocean: H2Ocean makes an ointment for new tats, as well as two types of moisturizer; lotion and foam for healed tats. Nu Tattoo: Nu Tattoo's products are organic and free of chemicals. They make salves and lotions for all stages of healing tattoos. Sunscreen is the most important treatment after your tattoo has healed. 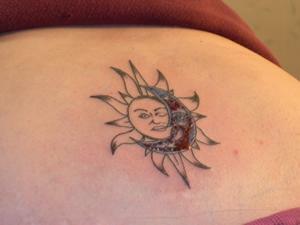 The sun's ultraviolet rays can fade tattoo inks, turning a bright design into a washed-out mess. Choose a good-quality sunscreen with an SPF of at least 30, and use it every day. Keep in mind, though, that sunscreen won't block out all UV rays. In fact, no tattoo skin care products will keep out the sun completely. If you work outside or spend a lot of time in the sun, you might want to consider an opaque sunscreen, such as a zinc cream, or just cover the tattoo when you're outdoors. Patricia Agin, Ph.D., Director of Scientific Affairs and R&D Leader at the Coppertone Solar Research Center shares information about the company's latest sunscreen products designed for tattoos. She notes that "Our research uncovered an opportunity to encourage daily sunscreen usage among people with tattoos. These individuals tend to be younger and on-the-go, and would benefit from convenient suncare options." She adds, "That's why Coppertone Tattoo GUARD sunscreens are available in portable forms, which are easy to carry and apply. This is a benefit for individuals with tattoos because UV rays may not only fade or blur their tattoos over time, but also can dry the skin and cause sunburn." 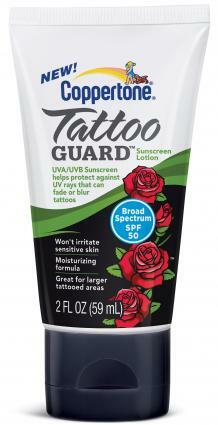 The Tattoo GUARD line comes in two forms, both of which provide broad spectrum protection in an SPF 50 moisturizing formula. Sunscreen Stick SPF 50+: Dr. Agin notes that this product "is helpful for spot application on smaller tattoos as well as the ears, nose and face." Sunscreen Lotion SPF 50: According to Dr. Agin, this product "works well for larger tattooed areas as well as the rest of the body." Dr. Agin adds that she and Coppertone "hope to encourage people with tattoos to become more proactive about taking care of their skin through convenient sun protection that is also appropriate to use on their tattoos." Neutrogena Pure and Free: Neutrogena Pure and Free is another high SPF sunscreen that contains few chemicals to irritate your skin. Pure Zinc Oxide: If you don't want chemicals on your new tat, use pure zinc oxide. Simply mix it with coconut oil to make it spreadable before applying. Coppertone Water Babies: This is a high SPF sunscreen that is designed for babies, so it will be gentle on a newly healed tattoo. It comes in several easy to apply methods as well. You don't need any special tattoo skin care products to keep a new tattoo clean. Just choose a gentle soap without any strong fragrances or colors. Wash the tattoo carefully, using your fingertips or palm. Don't scrub too hard and don't use a washcloth for about two weeks, until the skin has fully healed. Some tattoo artists do recommend that you use an antibacterial soap, such as Dial, for the first few washes after the bandages come off. Talk to your tattoo artist about his or her own skip product regimen. Many artists will offer touch-up work for free if you have problems with healing, but only if you've taken good care of the tattoo. Whether or not you choose a special tattoo skin care product, it's a good idea to work with your artist in creating a skin care regimen for the best possible result.